That’s why I decided to do something I’ve never done in January. I took my March stroll, the walk around the yard when I look for bits of green, tiny buds, and any hints of the coming spring. As I pushed fallen oak leaves aside, I felt like a kid searching the house for hidden Christmas presents — which, Mom and Dad, I never, ever did. It’s abundantly clear how much we have in common. Amazing wit, devilishly good looks, a dab hand with a broom, a miracle worker in the garden & the same choice in plants. These could easily be shots from my own back yard…weeeds n’ all! At least I know I’m in good company. Weeds do tend to thrive, no matter the season. Love that Henbit. It’s an edible weed, right? I must admit, I have no idea. In fact, readers, like yourself, identified it for me. I lumped it into the weed category, but it seems I need to brush up on what’s a weed and what’s not a weed. That is the question. Thanks for the help. weed is the jerkish name for native species/plant. You might be onto something. Thanks for your comment. great photos, there always seems to be some kind of movement or growth in the garden even in a mild midwinter! I think that’s the miracle of gardening — that life is happening all around us, even when we’re not looking. Many, many thanks. It’s been a trip! You could well be living next door, conditions here seem to be much the same. I like the shot of the Hardy Geranium best of all. Hello Alistair. Today, February 1, the temperature topped 60 degrees. As much as I enjoyed the warmth, I’m a little concerned what this is doing to the internal clocks of the trees, shrubs, perennials, and wildlife. A very odd winter. I have seen my winter aconites and snowdrops blooming, a full 2 -3 weeks early. And my honeybees are active! I’m certainly in the gardening mood, but I wonder if there will be any long-term implications for the plants and wildlife. I wonder if the mild weather is throwing off their cycles. It’s the same thing around here: I actually saw my neighbors yellow daffodils blooming almost 2 weeks ago! Funny, I do the same as you and take that spring stroll every year. We love our plants, don’t we? Yes, we are crazy for our plants — and also to see some green after the browns and grays of winter, even one as mild as this one. Thank you for commenting, and enjoy your day! I go around looking for little signs, too. They’re there if we just look! Your weeds are tiny compared to mine! Ah! The anticicipation of it all. Wonderful! oh my goodness, this post makes me wish desperately for spring. I love that walk around the garden just when things are about to jump into action. It’s a very specific shade of green that does it or me. It’s fresh and new and bright — a sign of life in all of the brown. Soon. Very soon. Thanks for the link to this book! And, again, for the Versatile Blogger nod. My daughter is visiting now, so I am coasting with vintage photo posts, but I will follow up on that soon. You are very welcome, and very deserving. Enjoy the time with your daughter! Just did the end-o–January pretending it’s March stroll yesterday. I was happy and dismayed to see my crocuses in full bloom. I scolded them soundly saying, “Don’t you guys have any idea how you are messing up my entire spring bulb plan???!! !” They refused to go back into the earth. I suppose I’ll just have to enjoy them and hope they don’t start a mass bulb uprising (pun intended) in the garden. Love the hardy geranium pic! My advice: Arm yourself! The bulbs are coming! 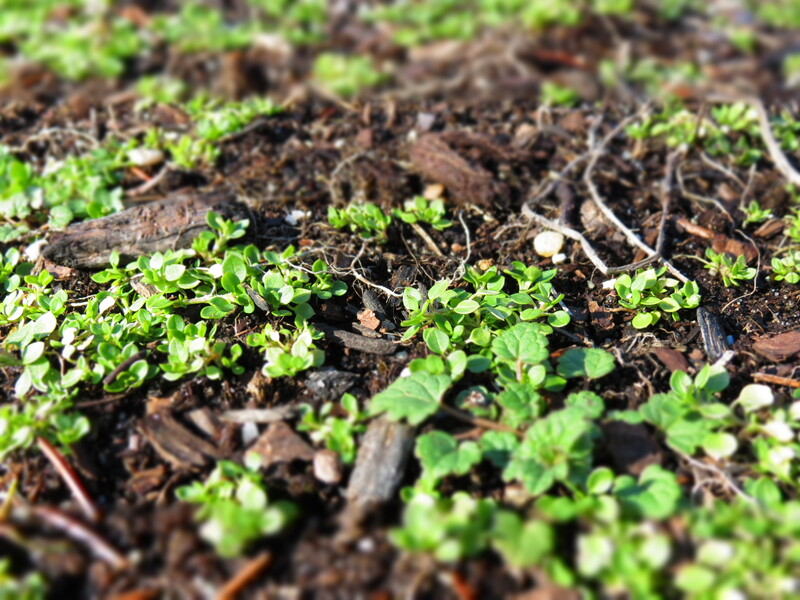 I have more weeds growing with this mild winter than flowers I think. LOL! 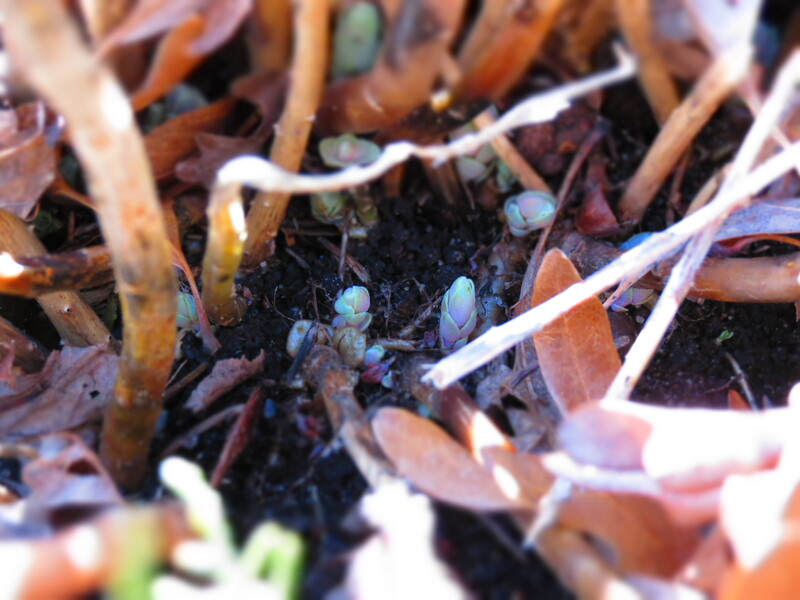 It is amazing and a little scary to see the plants starting to grow so early. It is a little alarming to see things starting to bloom. I wonder if there will be any long-term implications to this sultry winter. For as mild a winter as it has been, not much popping up here. But at the botanical garden today, I saw the daffodils sprouting, but not in my garden yet. Lots of nice images today, Kevin. Glad you enjoyed the photos — but be vigilant. Spring is in the air — a little out of step, but on its way. Frozen images of Europe are all over the news here. After our mild winter, it’s easy to forget how cold cold can be, and how dangerous. Stay warm and stay safe. Kevin, In Gettysburg, the Feb. 1 temperature felt like April 1. 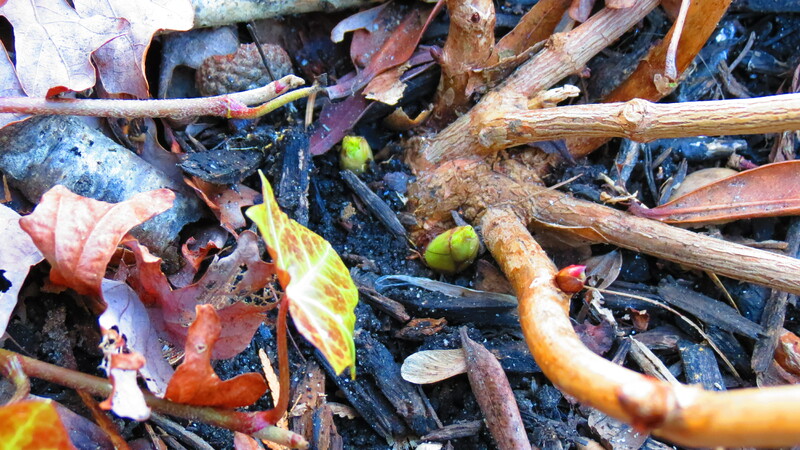 Like you, I’ve found myself outside looking for new growth in the garden — and finding a surprising amount of it. I did see one long-range weather forecast that was predicting colder than average temperatures for the second half of February and for March. So maybe Punxatawney Phil (the most famous groundhog in Pennsylvania) was right about 6 more weeks of winter — but I’m finding it hard not to feel complacent about our mild winter thus far. What I find interesting is how quickly I forget how cold cold can feel. I’ve heard the same forecasts and I’ve watched the footage of the frozen temps in Europe. Time will tell, but I’m keeping my fingers crossed for mild. I like the version by Jars of Clay, Bleak Midwinter. Very nice. Mellow. Yikes! Did you pull that henbit while you were out there? I cannot imagine this is the last of the winter. I mean, really? That’s all? The bugs will be horrendous, if this is all we get, dontcha think?? I’m not familiar with that band, but I will check them out. I left the weeds where they are — at least it’s green. And, I agree, spring should be interesting. So glad I’m not the only one who knows this band. Hello and thank you for visiting my blog. So far, so good — the mild weather continues and spring is in the air. That’s enough to give anyone an appetite! Happy harvesting! Hello and thanks for commenting. Glad you enjoyed the photos and post. Hello and thanks for visiting. Glad you enjoyed the photos and post. Cheers! This is all a bit overwhelming — I will definitely stop by for a visit. Thanks for commenting. Hello and welcome. So far, the weather seems to be holding up — no sign of snow and cold. I’ve seen on the news about the frigid weather encasing Europe. Stay warm — and here’s hoping to a speedy return to spring. Cheers! These are stunning and beautiful colors! I am a WordPress photoblogger as well, and nature is one of my favorite things to photograph. Great job. Thank you. I appreciate your feedback and I look forward to visiting your site. 50 degrees here in CT – and I think like many others have said, this whole winter just seems “off”. Oh I’ve got those weeds coming fast and furious too! I thought this was really interesting. It is that time of year after all: the bulbs and the buds are coming out! I’m glad you enjoyed the post — and many thanks for the reblogging honor. I appreciate the support. I love this post! My backyard is full of buds! I have lilly of the valley and iris actually blooming! I have buds on my hydrangeas and my flowering trees. It’s just crazy! Glad you found my blog, and I look forward to visiting your site. I haven’t seen buds yet — other than some crocus. But my eyes are wide open and eager for the thrill of spring. Enjoy your day. Connie, thanks for stopping by. Spring is certainly a season of wonder — then again, all of the seasons have something to celebrate. Kevin! You are freshly pressed..congratulations! 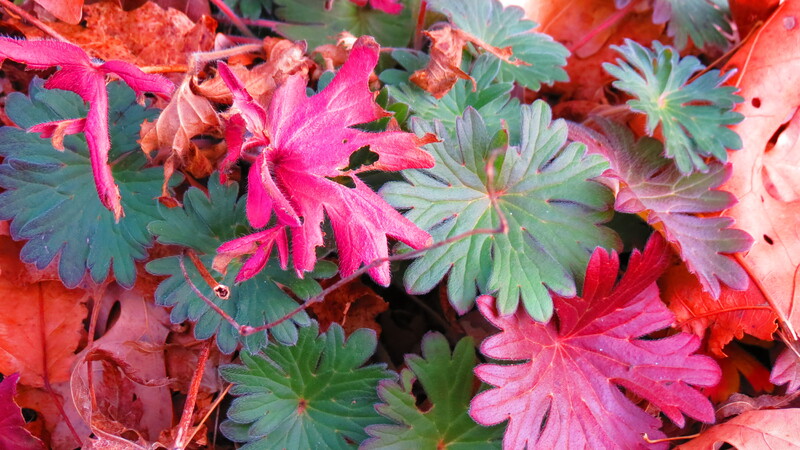 Sweet photos….what gorgeous colours in geranium…. I was so surprised! I thought something was wrong with the stats page when I saw the numbers going up and up. An amazing resonse, and I am so thankful for your support and encouragement. Best always! Fresh photos. I really enjoy those first hints of life after winter. When I take my dog for our daily stroll in SoCal I always feel like we pass all four seasons. There are fall leaves, fresh blooms, bright summery flowers, and of course the occasional dead plant. Glad you liked the photos. I’m trying to restrain myself from cleaning up all of the autumn and winter debris in an effort to hurry up and bring on spring and summer. Everything in its own time. Enjoy your long walks. Love your photos and “anticipation” theme. I am in the same place as you right now, in Southern Ontario and watching for signs of life. Unlike Kevin, I have totally given over to the urge to clean up the autumn and winter debris, though. Glad you found my site. I keep waiting for winter to get here — so I use the yard debris to keep the plants somewhat protected. I mean, winter will arrive. Won’t it? I did not catch which part of the world you are gardening in, Kevin, but I truly believe it is giving us a miss in Southern Ontario this year. The snowdrops know best, and they are coming up. I am located on Long Island, NY. The winter here has been extraordinarily mild — I just keep waiting for any sort of winter blast to get here. We shall see. . .
wow. I kept seeing them for a little more than you usually see a pic. Hello and welcome to my blog. I am so pleased that you enjoyed the photos. Cheers! The colors I love so…. Enjoy. Glad you enjoyed the photos. Cheers! Oh, how very lovely! Your hardy geranium is beautiful and would love to see your hydrangea’s once in bloom. Hopefully spring will arrive soon! Many thanks for your kind words. Stay tuned for more bloomin’ pics. Spring will be here before we know it. The balmy midwinter indeed! Just posted a similar entry about Boston’s breaking flora. 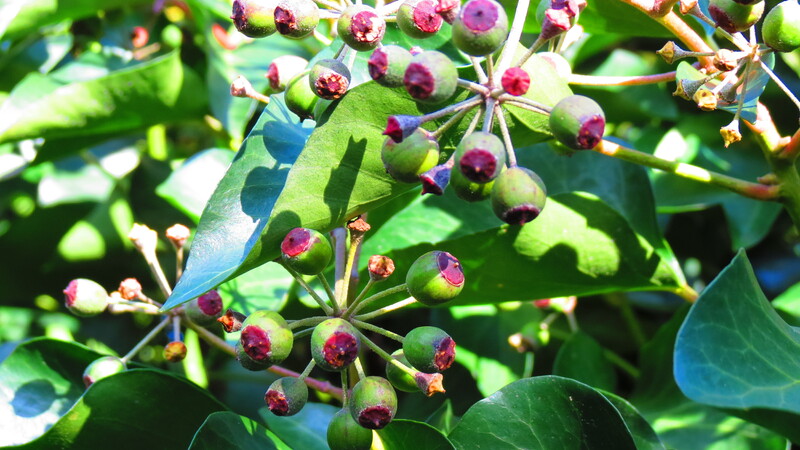 I love your hydrangea buds peeking out of the crown. As we would say up here, they’re just chaahhhhming. Congrats on getting pressed! I will definitely pop over to your site. This whole pressed thing has been amazing. Thanks for commenting and here’s to hoping we continue to enjoy a mild winter. I do wonder if the mild weather will have an impact on trees and plants. 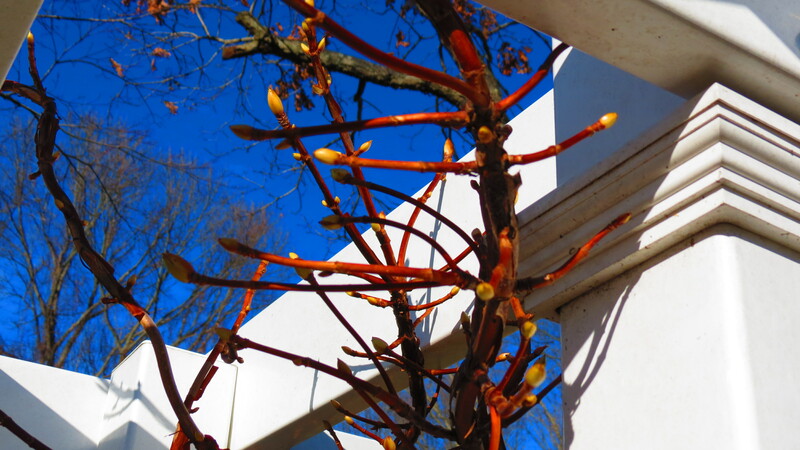 I haven’t seen buds on the dogwood — yet. It’s only a matter of time. Thanks for commenting! I love the sedum! But why oh why must weeds be so prolific? Mine aren’t growing yet here in Idaho…but they’ll be out with a vengeance soon. But they are pretty when you take a picture of them like that (and they’re in your yard…not mine). I’m glad you can vicariously enjoy my weeds. It’s pretty amazing how green they are. A few more months, though, and they’re out of here. Thanks for commenting! Your pictures are beautiful! They remind me of my father, who loves his yard and takes wonderful care of it. It was warm last week where I live, also. I took some pictures at the park. Flowers were in bloom. It has not been a bad winter. Thank you for sharing. Hi. I’m so glad that the photos brought back some memories for you. They’re priceless. Enjoy the mild weather while it lasts. Cheers! No signs of life yet in the garden, but I’m stalking….now the greenhouse is another story! I am so ready to get in the potting shed and get seeds started. A few more weeks and I will be awash in green. Keep looking for spring. The colors are vividly lovely. Thank you for commenting and for your kind words. Enjoy your day. Kris, thank you so much for commenting. I’m glad you enjoy my blog, and I look forward to popping over to your site. Cheers! Ah, hints of spring in winter! . . . Lovely photos! I love this, I’m such a plant lady. My room may be a small jungle. Hello and thanks for commenting. You may be a plant lady, but after visiting your site, it’s safe to say that you’re also a book lady. Happy gardening — outdoors and indoors. Your blogsite is very interesting, and I find your responses very amusing and profound at times. This site gives the gardener something to think about on the indoors! Linda, thank you for visiting and for your kind words. Enjoy your day. I don’t remember it although you might think I do, but the blizzard of 1888 was in March. All we can do is hope for an early spring. I know. And I also remember snowstorms in April. Waaaaahhhhhh. I know. And I remember snowstorms in April. Waaahhhh. Hello and welcome and thank you for commenting. Enjoy your day. Hello and thanks for stopping by. Enjoy your day. Nice weed, dude. I am thinking about going ahead and putting out my weed and feed. Too early? South Carolina, zone 8 I think. Thanks. I’m not too sure about the weed and feed — I never use the stuff. I like to weed the old fashioned way — but that’s another post. Glad you stopped by. Cheers! From one plant geek to another. Awesome. Hey there. Glad you liked the post and thanks for commenting. Cheers! Thanks, and I’m glad you stopped by. Enjoy your day. Sue from Grainry Antiques – great post! My azaelas are budding already and it’s going to freeze next week here in southern Indiana. Guess i won’t have these beautiful flowers (my favorite) again this year! My grass also needs to be cut! Waaay too early! It is very early! I hope the freeze isn’t too damaging, but perhaps Mother Nature will be able heal herself do it’s not a total loss. Thanks for commenting. Great inspiration to feed my spring fever! I walk out into the garden (when not covered by snow like now!) and always look for starts of life. Great photos, thanks for sharing! Debbie, welcome! I’m glad I was able to help satisfy the Spring Fever itch. Just a few more weeks to go! Hang in there. These beautiful pictures are sure to inspire our gardening group members in a very cold Scotland! Thank you. Happy I could help — but Scotland, in my opinion, is inspiring in and of itself. Enjoy your day! Eryka, welcome! I’m glad the you liked what you found here. Enjoy your day, and I’ll be sure to visit your site. my dad has a green thumb.guess he’ll be gardening by the age of 60..those pictures are shouting of joy..healthy i guess. I think it’s safe to say there’s joy and health in anything about which you’re passionate. Enjoy your day! A fun post. Thanks for sharing. I’m waiting for the crocuses and daffodils to appear. The blooms will be here before you know it. Hang in there. Cheers! Wow! Thank you for sharing, and congrats on all the comments 🙂 I love the Bleak Midwinter carol too. I am originally from the midwestern US and it gets pretty darn bleak out there some times in the winter. I always get that song stuck in my head, but when I sing it, I have never known anyone who knew it though, so it’s nice to read your post and know I’m not the only one! Thanks for finding me. I find this particular carol very haunting — and I know for a fact that you and I are not the only people drawn to it. Hope you’ll be back again. Cheers! I love this! I always get excited when I see the first shoots coming from the grown and buds starting to appear. Thanks for sharing. Thanks for visiting and commenting. There is nothing quite like those first shoots of green. Be well. This is a nice post. Any bloom is a reminder of new beginnings—hope. Your article inspired me to be more keen on the “blooms” around me. Thumbs up! Thank you for your kind words. I hope there is new life emerging for spring — wherever you are. Cheers! Great post! I moved to the Smoky Mountains of Tennessee earlier this year, so I am seeing ‘what comes back and when’ here for the first time. I tossed out a bunch of poppy seeds this fall, as they seem to grow well here. As Stevie Smith said of the blossoms in the gaudy print of her maiden aunt’s floral dress, ‘every one came up’. Looks like I will have a vivid red swath in my garden this summer. That sounds amazing. I am a fan of red in the garden, and this year I plan on having lots of it. Stay tuned for a future post. Hope your garden dreams come true! Martine, welcome and many thanks for commenting. Enjoy your day. Nice blog, man! Something I want to work on this summer is my gardening. When I was little I used to help my parents with a our HUGE garden every (extended) summer, and I really miss digging my hands in the dirt. Thanks for continuing my new (old) urge to garden! Glad I could trigger a memory and get you back in the dirt. It’s a great feeling to plant something and watch it grow. Happy planting! I find this dramatically beautiful and interesting! Hello and thanks for commenting. Enjoy your day! I love the photos and the reminder that spring (and gardening season) is not too far around the corner. However, this year, it may come earlier than normal with the unusual warm weather we are having:) I enjoy gardening as well as photography myself. I will have to admit though….I’ve always taken loads of photos of my gardens in bloom but have yet to take photographs of them before they pop out of the grown…perhaps this is a chance for some new shots! Hello and welcome. By all means, get that camera and capture spring emerging. Thank you for your kind words, and feel free to wander about. Cheers! Hello and welcome. Glad you found my blog and enjoyed the content. Hope you have time to wander around. Cheers! Great photos! I did my first gardening today. Pruned and mulched the collards that have overwintered. Pulled a few weeds. The garlic is looking great as are the onion sets I set out earlier. Northcentral AR hasn’t seen any brutal cold at all. Congratulations! I haven’t done any gardening — just picking up branches and hunting for hints of spring. Seeds will be started in a few weeks, and I cannot wait to get dirty! Cheers! What a lovely site – I can’t wait for Spring to come to my garden so thank you for giving me an early peek of things to come! You and me both. All of these little hints, I feel, are just a tease. Thanks for your comment. Cheers! Yeah. I’m glad “global warming” is only a myth, aren’t you? I know. The same thought is running through my head. Thanks for commenting. Beautiful pictures! I can’t wait until Spring… Winter seems to me to be longer than usual this year. I’m looking forward to my garden bursting into bloom, but perhaps I should go out and look for the little first signs like you have! I understand that your part of the world has been blasted with winter cold. Here, on the east coast of the States, it feels like spring wants to start, but winter keeps doing this dance. Actually, we have very little to complain about in terms of winter cold here. Stay warm, and thanks for your comment. Your post and blog are lovely! This year I had to move from my long loved and tended garden in the northeast USA where I also took spring review of the garden. I am now transplanted (lol) to Shanghai China and live in a high rise where my gardening can’t extend beyond the herbs on my windowsill. It was so nice to read your blog and remember the days where I still needed gloves but I could feel the first hints of warmth on the back of my neck from the winter sunshine. I was totally transported. Thank you. Thank you for your lovely comment. Glad I could stir some memories for you. By the way, it does not matter how large or small your garden is — as long as you can make something grow and enjoy the rewards. Enjoy your day! Hello and many thanks for the reblog! I’ve seen the news coverage of the weather in Europe. The nice things about bulbs is that they’ll slow down in the cold, and then restart when it warms up. Hmmmmm. Sounds a little like me. Thanks for commenting. Kevin, congrats on being ‘Freshly Pressed’!! I have enjoyed your blog for only a short time, but, definitely enjoy your posts. Many thanks! I’m happy that you found me, and that you enjoy the content. Cheers!